Computer Taskmate Height Adjustable Work Station. 6200- TaskMate Journey: Includes Adjustable Keyboard Mechanism & All-in-One Keyboard & Mouse Tray. 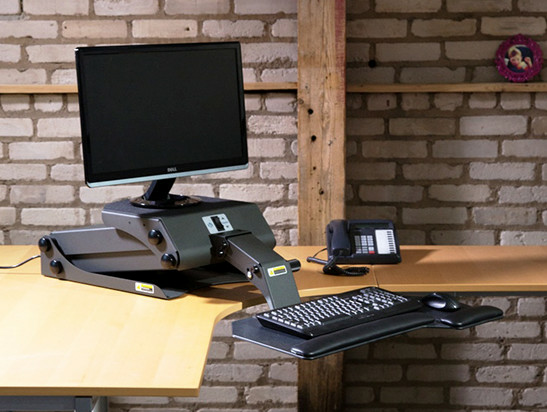 The innovative design of the TaskMate creates the perfect height adjustable solution for today's workplace. The TaskMate is small enough to fit onto an existing desk or workbench yet durable enough for daily use. The clean look and quiet movement is a great addition to any workplace. The available options can customize the TaskMate so your workplace is elevated the perfect level. Start with the basic TaskMate and add whatever accessories you need so your workspace comfortably fit for your needs. 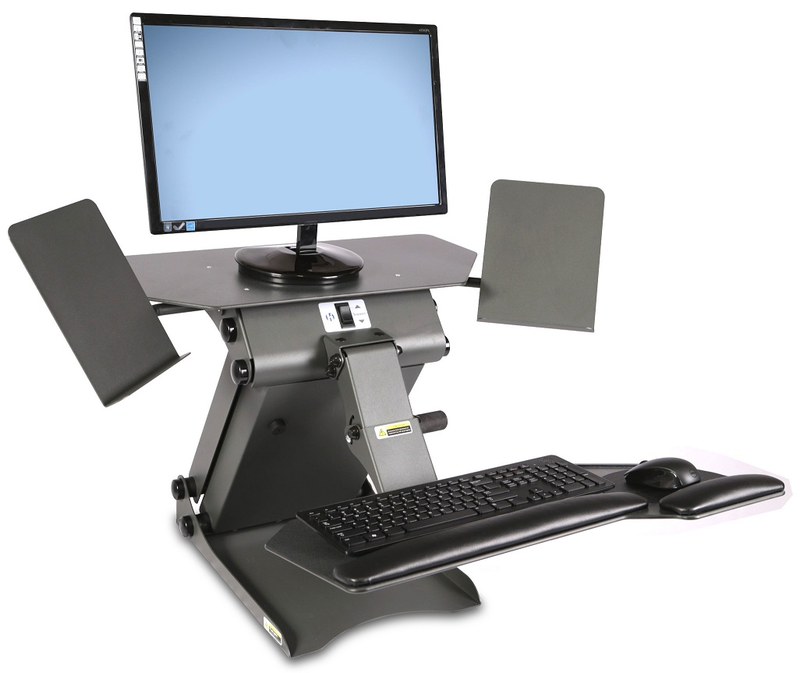 The TaskMate™ positioning unit converts any desk or table without modification into a height adjustable computer workstation. Here’s how to use it. Set the TaskMate™ on your desk or table. No fastening of any type is needed. Secure your computer monitor on the monitor platform. Place your computer keyboard, mouse or other input device on the keyboard and mouse platform. Plug the cord into a standard wall outlet. The TaskMate™ is controlled by two easy to reach buttons. The keyboard platform is controlled by a lever underneath that allows you to make the angle and height adjustable for proper wrist positioning to minimize the occurrence of carpal tunnel. Built-in wrist rest is a soft, cushioned gel pad. The TaskMate™ positioning unit keeps a low profile on your desk with no fastening—and its adjustable controls are quiet. The positioning unit is ergonomically designed to keep your wrist and hands level. Quality gray powder coated steel will match your Stance® angle chair and is designed to match any office décor. Adjust independently of the monitor platform. Just move the lever to change keyboard height or angle to allow for proper wrist positioning to minimize the occurrence of carpal tunnel. Built-in wrist rest is a soft, cushioned gel pad. Non-skid surface securely holds any size or type of monitor, from flat panel screen to 75-pound CRT. Non-skid base is weighted for extra stability. Can be mounted to the right or left of keyboard platform. Slides easily under keyboard platform for storage. Choose small or large stands to hold your paperwork or phone in place at just the right level. Attaches to the side of the monitor platform. Allows you to extend the sides of the monitor platform up to 23” inches. Holds the latest flat screen panel (i.e. Apple 23” Cinema Screen) and is perfect for holding your external speakers. Monitor, Copy Holders and Speaker Extensions not included. A comfort mat is also available.